by Obsidian Learning and RISC, Inc.
A white paper by Obsidian Learning, “Cracking the Mobile Learning Code: xAPI and cmi5”, co-authored with Art Werkenthin of RISC, Inc., discusses how mobile technologies can support both formal and informal learning in instructor-led training (ILT), web-based training (WBT), blended learning experiences, and on-the-job performance support. It also addresses global trends in mobile technology use, and presents examples of novel applications of mobile learning. 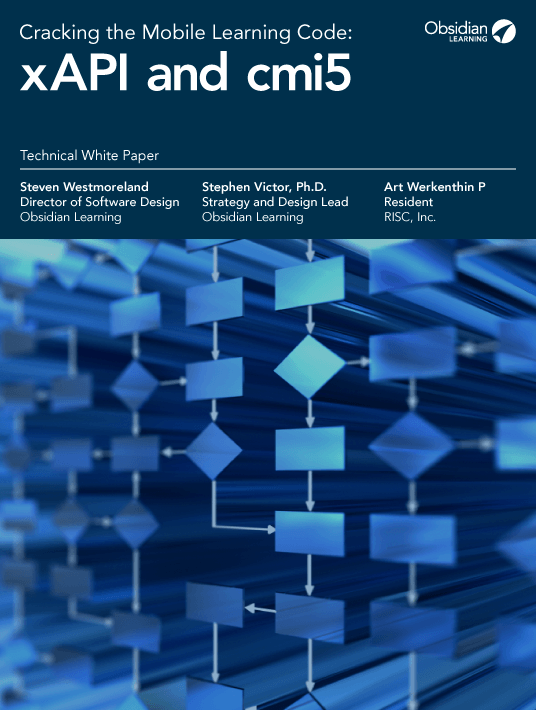 Finally, it provides a technical overview of xAPI and cmi5 and examines how these technologies can be used to capture the entire spectrum of learning, from formal to informal. Is xAPI the “New SCORM”? As mobile technologies have become more integrated into our daily lives, the lines between formal and informal learning have begun to blur. While it has always been true that human beings are (or can be) learning in every waking moment (either formally or informally), mobile technologies that use xAPI and cmi5 have heightened the possibilities for tracking and measuring the full range of learning. Mobile Technologies do make your life easier when it comes to both formal and informal learning in instructor-led training (ILT), web-based training (WBT), blended learning experiences, and on-the-job performance support. Download this white paper to figure out how these Mobile Technologies can be implemented in order to support and boost every kind of learning.